What started as a joke at camps and lessons has turned into a mascot for 4Life. Skillet Head is a character that truly embraces the fun aspect of 4Life and the humor that is associated within each lesson we teach. Whether it be on the field or in a gym you may hear “skillet” called out at any point which means Rocky is probably around encouraging kids to do their best. 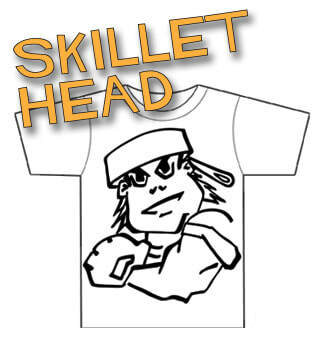 We have a limited number of skillet head T-Shirts available in youth sizes small, medium and large. If you would like to purchase one please contact us and we can send you one. Cost is $20 and includes shipping and handling as we are more than happy to ship it to you. We will soon have our Skillet Head shirts available to purchase through the site. Until then please just contact us if you would like to get your hands on one.